Hewlett-Packard is at least starting today’s earnings report with good news: It has beat the expectations of Wall Street analysts. Per-share earnings at 98 cents beat the Street forecast of 91 cents, while sales, which were thought to be light, came in at $30.7 billion, ahead of the $29.9 billion consensus. As part of the restructuring plan, HP expects approximately 27,000 employees, or approximately 8% of the company’s workforce as of October 31, 2011, to exit the company by the end of fiscal 2014, with a portion of those employees exiting the company as part of a voluntary early retirement program for U.S. employees whose combined age and years of service exceed certain levels. The total number of employees ultimately affected will be impacted by the number of employees that opt to participate in the early retirement program. The changes to HP’s workforce will vary by country, based on local legal requirements and consultations with employee works councils and other employee representatives, as appropriate. In connection with the restructuring plan, HP expects to record aggregate pre-tax charges of approximately $3.5 billion through the end of HP’s 2014 fiscal year beginning in the third quarter of HP’s 2012 fiscal year. Of that amount, HP expects approximately $3.0 billion to relate to the workforce reductions and approximately $0.5 billion to relate to other items, including data center and real estate consolidation. HP expects approximately $2.7 billion of those aggregate pre-tax charges to result in cash expenditures during the term of the plan. HP expects to amend its U.S. pension plans to facilitate the funding of a portion of the cash expenditures using available U.S. pension plan assets. The idea is apparently to get things under way in the third quarter of this year, which is the current quarter, and to take charges of $3.5 billion by the end of 2014, most of it in workforce reductions. That is in line with CEO Meg Whitman’s claim that the turnaround is going to take a few years. The 27,000 jobs eliminated amount to about 8 percent of the workforce. Of that, HP will take a $1.7 billion pre-tax charge this year. There’s also going to be some “SKU rationalization,” which is something I’ve written about before. Look for some products to get axed around this. “While some of these actions are difficult because they involve the loss of jobs, they are necessary to improve execution and to fund the long term health of the company. We are setting HP on a path to extend our global leadership and deliver the greatest value to customers and shareholders,” Whitman said in a statement. As AllThingsD also told you last week, the changes will be made in order to reinvest in things like research and development, one area that’s widely thought to have suffered too much in the last decade or so. There will also be investments in services, software and enterprise hardware. Another surprise: Mike Lynch, the CEO of Autonomy, the British software company that HP paid $12 billion for last year and which was seen as an albatross around the neck of prior CEO Léo Apotheker, is stepping down. He’s not the only one, as other former CEOs of software companies that HP has acquired also have departed about a year later. Bill Veghte, HP’s chief strategy officer and executive vice president of HP Software, will run Autonomy. I had been hearing rumblings that Lynch would be leaving, but was never able to track it down. Here’s the earnings announcement. I’ll have more as I go through it. Information about HP’s use of non-GAAP financial information is provided under “Use of non-GAAP financial information” below. HP (HPQ) today announced financial results for its second fiscal quarter ended April 30, 2012. For the quarter, net revenue of $30.7 billion was down 3% year over year both as reported and when adjusted for the effects of currency. GAAP diluted earnings per share (EPS) was $0.80, down 24% from the prior-year period. Non-GAAP diluted EPS was $0.98, down 21% from the prior-year period. Second quarter non-GAAP earnings information excludes after-tax costs of $356 million, or $0.18 per diluted share, related to amortization of purchased intangible assets, restructuring charges and acquisition-related charges. Personal Systems Group (PSG) revenue was flat year over year with a 5.5% operating margin. Commercial revenue increased 3%, and Consumer revenue declined 4% while Workstations revenue was down 1% year over year. Desktop units were up 5%, notebook units were down 6% and total units were down 1%. Services revenue declined 1% year over year with an 11.3% operating margin. Technology Services revenue was flat year over year, Application and Business Services revenue grew 1% and IT Outsourcing revenue declined 3% year over year. Imaging and Printing Group (IPG) revenue declined 10% year over year with a 13.2% operating margin. Commercial hardware revenue was down 4% year over year with commercial printer units down 7%. Consumer hardware revenue was down 15% year over year with a 13% decline in printer units. Enterprise Servers, Storage and Networking (ESSN) revenue declined 6% year over year with an 11.2% operating margin. Networking revenue was up 2%, Industry Standard Servers revenue was down 6%, Business Critical Systems revenue was down 23%, and Storage revenue was up 1% year over year. HP Financial Services revenue grew 9% year over year driven by a 4% increase in net portfolio assets and a 5% increase in financing volume. The business delivered a 9.9% operating margin. Software revenue grew 22% year over year with a 17.7% operating margin, including the results of Autonomy. Software revenue was driven by 7% license growth, 17% support growth, and 72% growth in services. Autonomy saw a significant decline in license revenue. To help improve Autonomy’s performance, Bill Veghte, HP’s chief strategy officer and executive vice president of HP Software, will step in to lead Autonomy. Veghte is an experienced software leader who will help develop the right processes and discipline to scale Autonomy and fulfill its promise. Mike Lynch, Autonomy’s founder and executive vice president for Information Management, will leave HP after a transition period. The market and competitive positioning for Autonomy remain strong, particularly in cloud offerings. HP generated $2.5 billion in cash flow from operations in the second quarter. Inventory ended the quarter at $7.3 billion, with days of inventory up 2 days year over year to 28 days. Accounts receivable of $16.6 billion was down 4 days year over year to 49 days. Accounts payable ended the quarter at $12.9 billion, down 5 days from the prior-year period to 49 days. HP’s dividend payment of $0.12 per share in the second quarter resulted in cash usage of $251 million. HP also utilized $350 million of cash during the quarter to repurchase approximately 13 million shares of common stock in the open market. HP exited the quarter with $8.7 billion in gross cash. In connection with the restructuring efforts discussed in a separate press release issued today (http://www8.hp.com/us/en/hp-news/press-release.html?id=1247078), HP expects to record a pre-tax charge of approximately $1.7 billion in fiscal 2012 that will be included in its GAAP financial results for that period. Of that amount, HP expects to record a pre-tax charge of approximately $1.0 billion in its third fiscal quarter. The cash impact associated with the restructuring efforts is expected to be approximately $400 million in fiscal year 2012. Through fiscal 2014, HP expects to record additional pre-tax charges approximating $1.8 billion that will be included in its GAAP financial results for the applicable periods. 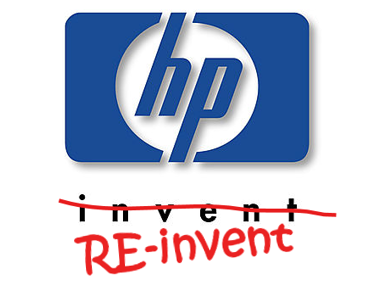 In May 2012, HP committed to a change in its PC branding strategy. As a result, HP has commenced an asset impairment analysis to determine the current value of the Compaq trade name acquired in 2002. Based on the preliminary results of that analysis, HP expects to record an impairment charge of up to approximately $1.2 billion that will be included in its GAAP financial results for its third fiscal quarter. There will be no cash impact associated with the impairment charge. For the third quarter of fiscal 2012, HP estimates non-GAAP diluted EPS to be in the range of $0.94 to $0.97 and GAAP diluted EPS to be in the range of $0.00 to $0.03. Third quarter fiscal 2012 non-GAAP diluted EPS estimates exclude after-tax costs of approximately $0.94 per share, related primarily to the amortization and impairment of purchased intangible assets, restructuring charges, and acquisition-related charges. For the full year fiscal 2012, HP now estimates non-GAAP diluted EPS to be in the range of $4.05 to $4.10 and GAAP diluted EPS to be in the range of $2.25 to $2.30. Full year fiscal 2012 non-GAAP diluted EPS estimates exclude after-tax costs of approximately $1.80 per share, related primarily to the amortization and impairment of purchased intangible assets, restructuring charges and acquisition-related charges. HP’s Q2 FY12 earnings conference call is accessible via an audio webcast at www.hp.com/investor/2012q2webcast.